We Rock the Spectrum – Dubai has been recognized as the Best Party Venue of the year! Dr. Nashila Farrah Jaffer speaks with Mother, Baby, and Child Awards 2018. 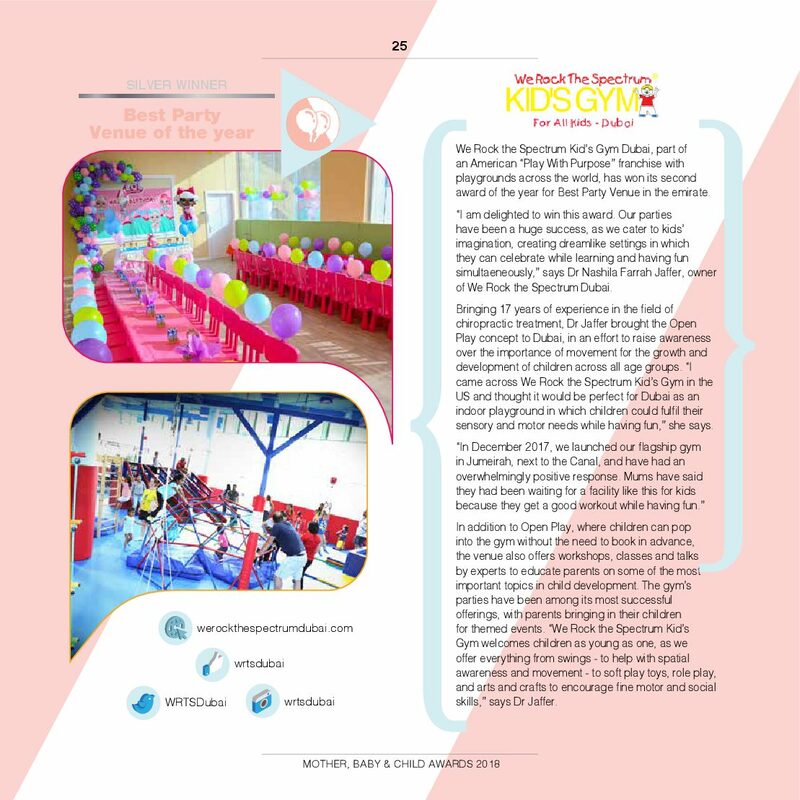 Time Out UAE Kids highlights We Rock the Spectrum – Dubai’s sensory play equipment and its positive impact on the growth and wellbeing of children. Dubai has something for everyone, that much is true. But when it comes to finding a safe environment for your kids to explore, develop, get exercise and not be defended with crazy gimmicks / even crazier kids and parents or over-crowding, the options can be reduced somewhat. 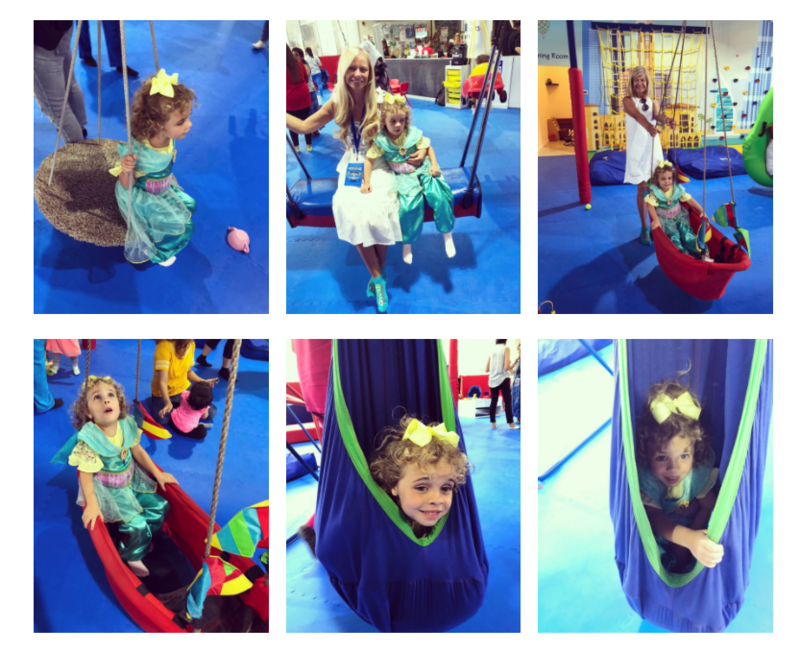 Recently, we have discovered We Rock the Spectrum Kids Gym in Beach Park Plaza. 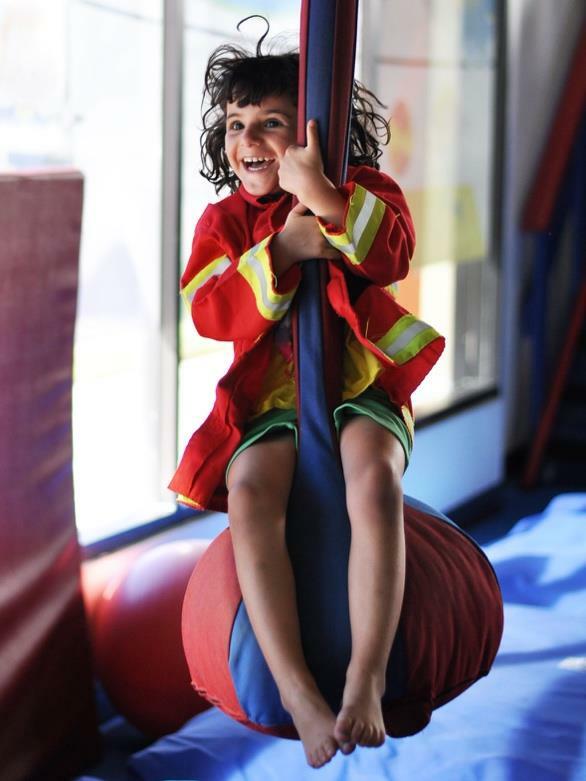 We Rock the Spectrum Dubai is committed to providing a safe, nurturing, and fun environment to foster learning, exploration and safe sensory experiences. It provides children with a fun and motivational environment to help them in the areas of strength, movement, sensory processing, communication, positive behavior modification, social interactions, and self-care skills. Our unique equipment assists all children in their neurological growth and development. I was lucky enough to have a chat with the beautiful and intelligent Dr. Nashila Farrah Jaffer and asked her why she has set this up and what was her motivation behind the project. I have been practicing as a Chiropractor for fifteen years now, and in recent years I have treated more and more children with developmental delays, weak motor skills and sensory issues. This has taken my career on to a more child-orientated path and one that I believe has led me to this point in my journey. I was inspired by the whole idea and framework of WRTS when I went to the States, and the real test was if my daughters, aged 4 and 6 years, would like it. They absolutely loved it and this is when I knew that the children in Dubai would benefit enormously from WRTS. My motivation has always been my two girls. They give me a fresh perspective every single day and they are my drive and inspiration. I am also passionate about raising awareness and educating parents on the importance of movement for all kids to lead a healthy, active lifestyle. Ultimately, it is my goal to improve the lives of children and families here in the UAE, whilst bringing an element of fun through therapeutic play. To make a great day even better, we were treated to delicious ice cream courtesy of Piccadilly Whippy. 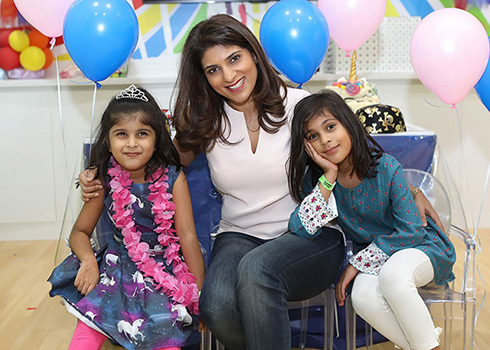 Dr. Nashila Farrah Jaffer is aChiropractic Physician, a mama of two and the founder of ‘We Rock The Spectrum‘, a relatively new play space in the Beach Park Plaza on Jumeirah Beach Road specifically developed to help child development (& a far cry from any other soft play area in Dubai). We chatted to her about why this space is about so much more than just fun! Why did you decide to set up WRTS in Dubai? I have been practicing as chiropractor for 17 years now and over the years I have seen more and more cases of children having developmental delays such as gross motor weakness, postural weakness and back pain at very young ages. I believe the reason for this is the sedentary lifestyle that we are all leading compared to 15 years ago when ipads and phones were not available. In the past, children led more active lifestyles because gadgets were not readily available like they are today, so kicking a football around or playing in the garden were the norm. Nowadays, children go to school from such an early age and have regular routines when really they should be actively learning and playing through movement. Movement is essential in the development of children’s neurological system. In fact 90% of stimulation to the brain comes from movement of the spine. So this lack of movement I feel has significantly affected the growth and development of children today. Being a mother myself, I have seen how important it is for my children to do something active every single day and in Dubai it is not the easiest with the hot summer months. Thankfully the parks are fabulous and they are a fantastic way to keep children moving and active and encourage a healthy lifestyle in the winter months. 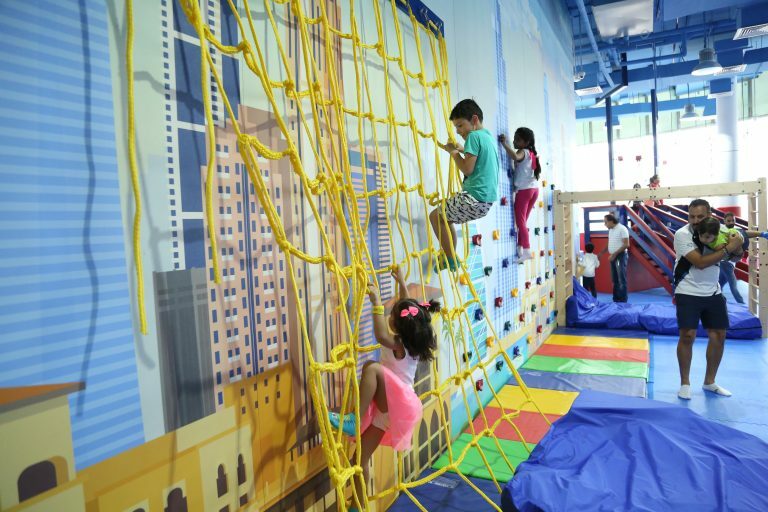 So when I came across We Rock the Spectrum Kid’s Gymwhilst searching online, I thought this would be perfect in Dubai as an indoor playground for children to fulfil their sensory and motor development needs whilst having fun. What kind of services and classes do you offer? We have Open Play whereby you can come with your child at any time of day, just like a regular gym, so you don’t need to prebook in advance, just show up at any time during the day. We encourage parents to play with their child inside the gym, but we also have a Drop n’ Shop optionwhere we can supervise your child for an hour or two. We have kids fitness classes, dance and drama classes, a maths enrichment program, birthday parties, coffee shop and free wifi too. We also work very closely with Pure Child Health, a centre that offers occupational therapy and speech and language therapy, and we run parent workshops at the gym to help educate parents about child development. Why is it so important that parents take their children to a gym? In a day and age where computers and ipads are so readily available, it is important for children to get into good habits early on and understand that movement is an essential part of an active, healthy lifestyle. Just as adults go to the gym and exercise to keep themselves fit, the same should be available for children so that it becomes a habit. If we can encourage the importance of exercise from a young age we will avoid many more health problems later on in life. What age should parents think about taking their kids to the gym? We Rock the Spectrum Kid’s Gym welcomes children as young as one year old. There are fun swings to help with spatial awareness and movement as well as soft play toys, role play and arts and crafts to encourage fine motor skills, as well as social skills interacting with other children. From birth to age five, a child’s brain develops more rapidly than at any other time in life. Scientific research has made clear that the quality of a child’s experiences in the first few years of life helps shape how their brain develops. Therefore, in my opinion I would encourage movement and activity as early as possible. Tell us about some of the specific benefits from the exercises you offer? There are ten pieces of equipment that will be found in every We Rock Kid’s Gym. These specialised pieces of equipment are all designed to stimulate your neurological system. For example, the climbing apparatus enhances body awareness, body scheme, motor planning and bilateral coordination. The child’s body weight, combined with gravity, provides additional proprioceptive feedback to the joints, helping the child coordinate their movement. The bolster swing provides a swinging side to side motion that is a great motor planning and motor sequencing activity. The trampoline builds lower body strength and helps to teach balance and provides a full body workout. The zip line, by far the most popular piece of equipment in the gym, is a great way to build upper extremity strength, muscle endurance, enhance the ability to integrate and tolerate movement and help give self-confidence as children challenge themselves to hold on long enough to get to the crash pit at the other end. the best part about it is that children are having fun whilst having a full workout without realising it! How do your services and classes cater to children on the Autism spectrum specifically? The equipment found at all We Rock The Spectrum Kid’s Gyms are the same pieces of equipment used in occupational therapy offices to help regulate children on the spectrum who experience sensory processing difficulties. In fact, statistics show that as many as one in six children experience sensory symptoms that could affect their everyday lives. We encourage parents with children on the spectrum to come and play with their child in an inclusive environment with children of all abilities. This encourages parent-child bonding, social interaction and a place where children of ALL abilities are welcomed. In addition, there are long waiting lists for some occupational therapy clinics and it can also be unaffordable for some families. How is the gym fully inclusive? And how do you cater to differently abled children? The gym is fully inclusive as we encourage children of all abilities to learn, play and grow together in a safe environment. We do not differentiate children into separate groups as the whole purpose and vision is to provide an inclusive environment for all kids to play together. Our staff are fully trained on the specialised equipment and we have a Calming Room for children who may need a break from the excitement of the gym. If you had to compare between your own childhood and the current lifestyle of your child, what would you say is the biggest difference? One of them has to be the availability of electronic devices. Walking into the mall or eating at a restaurant, you are sure to spot at least one child hooked on to the screen of a mobile phone or a tablet. I’m not going to be the parent that judges here. Perhaps these children have limited screen time in place already. Nevertheless, the fact remains that these kids are definitely not as active as we might have been 15 years ago. To back this up, say hello to Dr Nashila Jaffer, a chiropractic physician practicing for 17 years now, first in the UK and now in the UAE. 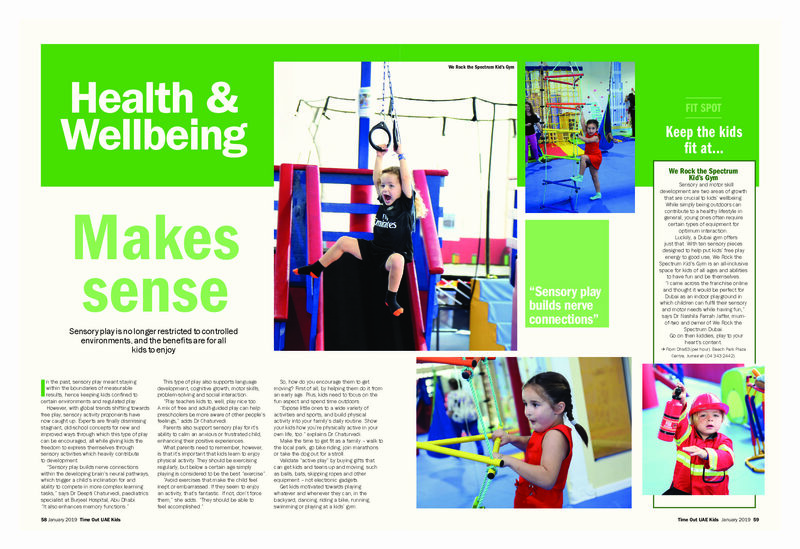 A mother of two and the mind behind ‘We Rock the Spectrum- Kids Gym’ (WRTS), a recently opened flagship gym in Jumeirah. 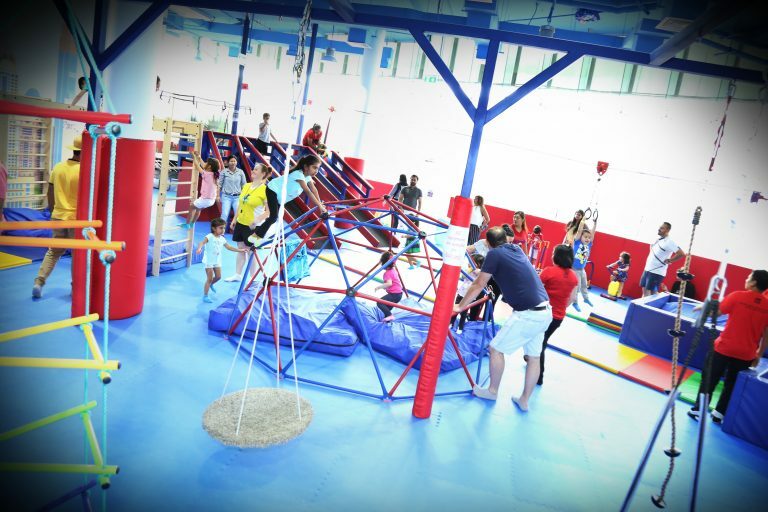 An indoor gym- playground for children of all abilities, and the answer to getting your child’s daily dose of physical activity in this hot and sunny Dubai. And I’m here to tell you what makes this place so different from the other traditional indoor play centres. HOW DID IT ALL BEGIN FOR WRTS? 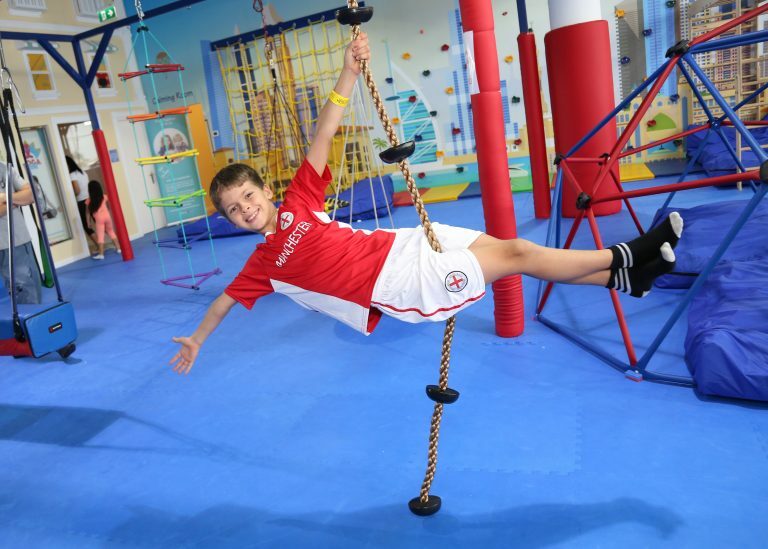 Located in Jumeirah, at Beach Park Plaza, WRTS Kid’s Gym opened in December 2017. It’s the first in UAE, however branches of WRTS are already found in 5 other countries, with over 70 locations, a sign of a successful idea. What this Kid’s Gym is committed to provide is exactly what attracted Dr Nashila to open a centre here in Dubai. Dr Nashila currently practices at Pure Child Health, a centre offering occupational therapy and speech & language therapy to children. Over the years of practice, she has been seeing more and more cases of developmental delays in children, such as muscle weakness, bad posture and also back pain at very young ages. Dr Nashila believes the reason for the sedentary lifestyle is the electronic gadgets, something we didn’t have to ‘play’ with when we were young. Our play time consisted of spending hours in the playground, riding bikes or playing tag. Nowadays, children not only start school at a very young age, but also have afterschool activities that has them ‘fixed’ in a structured routine. There is hardly any room for active learning and playing through movement. Parents, would you agree? Research shows physical activity is particularly essential for young children, as the first five years are important in their growth and development. Early physical activity not only helps set up good exercise habits that they will continue into adulthood, but also helps with their mental well being, social skills and more importantly , movement. While writing this post, I happened to read up on quite a bit of research and I’m sure it’s going to blow your mind, just as it did for me. Movement is essential when it comes to the development of children’s neurological system. Research shows that movement, especially of the spine, is required for proper brain function. Yes, the brain not only controls the body, but also requires constant stimulation, a constant input from movement to keep it charged and going. Lack of movement and decreased stimulation of the brain in childhood can also result in learning disabilities and concentration inabilities like ADHD. So, next time you find your child running around the house, know that it’s good for him/her. Getting back to WRTS, and the reason Dr Nashila was so confident about it was because she saw how much her own two girls benefitted from it, when visiting the US. 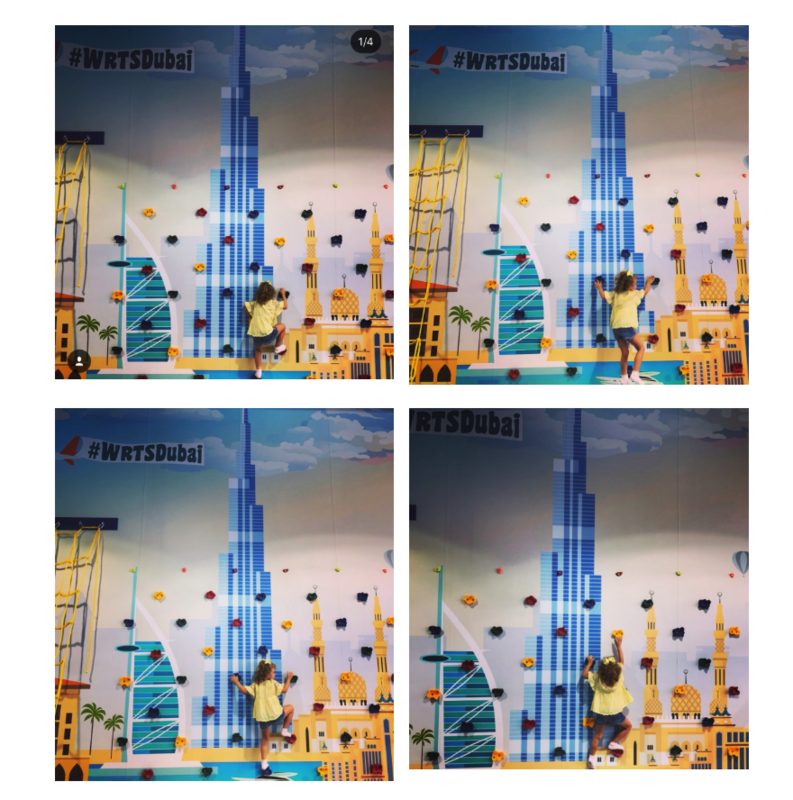 Once in Dubai, it became her goal to educate parents on the importance of movement, staying active whilst keeping in the element of fun for children. More so, because children here hardly get physical activity due to the long summer months of UAE. Having an indoor playground for children seemed the perfect answer. Hence, the first WRTS was opened in Dubai and the rest they say is history. THE EQUIPMENT AT WRTS KIDS GYM. The climbing structures enhances body awareness, bilateral coordination and helps the child coordinate his or her movements. The trampoline builds lower body strength, helps to teach balance and provides a full body workout. The zip line and crash pit, a firm favourite among all children, helps build upper extremity strength, muscle endurance, tolerate movement, and helps children with self-confidence, as they hang on long enough before reaching the crash pit at the other end. Other equipment include the tunnel, the carpet swing, zip box with slide and swivel rotators, again designed to encourage movement and help with the spatial awareness, for children of all abilities. So, while the children think they’ve been ‘playing’, we parents know that they’ve in fact been having an intense muscle workout. It’s what Dr Nashila calls ,”Play with a Purpose”. Children as young as one year old can benefit from these specialised equipment. My daughter, may have been too young to use the climbing structures or slide across the zip line, however she made full use of the tunnel, the swings and had a go at the trampoline. Yes, WRTS also have the usual soft play toys, role play toys and costumes, and an arts and craft corner to help with the development of their fine motor skills and social skills. WHAT ELSE CAN YOU EXPECT AT WRTS KIDS GYM? Open Play: Just like a regular gym, parents can turn up with their children at any time of the day, without any pre-booking, and make use of the equipment available to them. While there is also a ‘Drop and Shop’ option available, where parents can leave their children under the care of supervisors, they in fact encourage parents to play inside the gym with them. It’s not only great for bonding and building confidence, but also sets a wonderful example to the children about keeping fit. You can even drop your children off and head upstairs to Fitness First for a workout yourself, completely assured that your child will bee fully supervised having a workout together as a family together is a fantastic and holistic approach to family well-being. Kids Classes: You will be able to enrol your children to various classes, such as fitness, dance and drama, dance fusion and math tuition. Watch how the children are able to improve their attention span, on task behaviour, coordination, poster, motor planning, muscle tone, and motor development. Birthday Parties: Your child is going to be loved at school after having his/her birthday party at WRTS. No worrying about booking in a magician or someone to face paint, while getting the children to sit quietly in rows. WRTS has a special party room for the cake ceremony and treats. And after all that sugar rush, let them loose and watch them have fun whilst having a full work out without even knowing! Rock Shop: Looking to continue that stimulation at home? Well then you can choose to buy from a range of sensory based toys, puzzles and books. Calm Room: A dedicated calm room with a few books and teepee to wind down after all the serious workout. AUTISM AND ADHD IN CHILDREN. HOW IS WRTS HERE TO HELP THEM? There seems to be a rise in children diagnosed with Autism and ADHD. The specialised equipment at WRTS is similar to the equipment used in occupational therapy offices to help regulate children on the spectrum who have autism, and show sensory processing difficulties. WRTS encourages parents with children on the spectrum to come and play together in a safe, inclusive environment with other children of different abilities, even if it is just for an hour. WRTS Dubai works very closely with Pure Child Health and run parent-child workshops at the gym to help educate parents about the development of your child. At times when occupational therapy seems very expensive, places such as WRTS are an affordable alternative. Whether about an hour’s play, a 5 session play package, play dates or even a birthday package, you can get in touch with WRTS for more information. Mumzy Notebook and WRTS have partnered together to host a giveaway, where one randomly selected lucky winner will walk away with one 5 session play pass to be used at WRTS, Jumeirah. The giveaway will run be running on Instagram from 8th of April until the 14th of April. Head over to Mumzy Notebook’s Instagram page to find out how you can enter and walk away with a wonderful prize for your child. Disclaimer: This is a sponsored post. Dr. Nashila, online research and the information available on WRTS website has helped me write this post. All views, opinions and photographs are of my own. first kids’ gym for children of all abilities. With childhood obesity in the UAE projected to reach more than 14% for the nation’s under-20s by 2020, parents are looking for easier ways to help their kids get active. Los Angeles, CA – November 10, 2017: The We Rock the Spectrum franchise announces the grand opening of its second international location: We Rock the Spectrum – Dubai. The opening is accompanied by a celebration Saturday, December 9th at the new gym, Beach Park Plaza Centre, Beach Road, Jumeirah, Dubai, UAE, from 3 pm to 7 pm. The event is open to the public, and families with children from all walks of life are encouraged to come. We Rock the Spectrum is a franchise opportunity that provides sensory-safe play for kids with autism, special needs, and neurotypical development. Each gym features ten pieces of therapeutic equipment. This equipment is specifically designed to work with many of the sensory processing issues that children on the spectrum face, while providing all children with the sensory-diet necessary for improved learning and neurological development. For example, the zip line helps children with vestibular sensations and sensory feedback, while allowing them to better develop upper-arm and core strength. Each We Rock the Spectrum location offers unique classes, children’s day camp opportunities, arts and crafts, additional pieces of play equipment, and more. An autism mom from California, Dina Kimmel, is the CEO and Founder of We Rock the Spectrum. Kimmel opened the first gym in Tarzana, California after her son was diagnosed with autism and she struggled to find a safe place where both her son and her daughter could go together. The motto for all We Rock the Spectrum gyms is “Finally a place where you never have to say I’m sorry!” Dr. Nashila Jaffer is the woman responsible for bringing the franchise to Dubai. She has been a practicing Chiropractor for the past 15 years, and decided to focus on a more children focused career after she began working more with children with developmental delays and sensory issues. 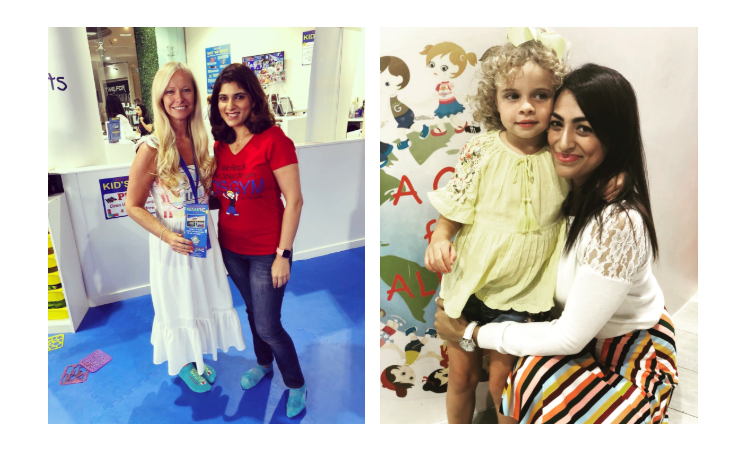 After discovering We Rock the Spectrum during a trip to the States, and seeing how much her daughters enjoyed it, Dr. Jaffer knew she had to bring this franchise to Dubai so other children could benefit from it. The celebration is open to children of all abilities. Children will be able to play with all the specialized equipment, including the trampoline, swings, and the zip line. It will be held at Beach Park Plaza Centre, Beach Road, Jumeirah, Dubai, UAE from 3 pm to 7 pm. About We Rock the Spectrum: Founded in 2010, We Rock the Spectrum is an international franchise opportunity that provides sensory-safe play for kids with autism, special needs, and neurotypical development. 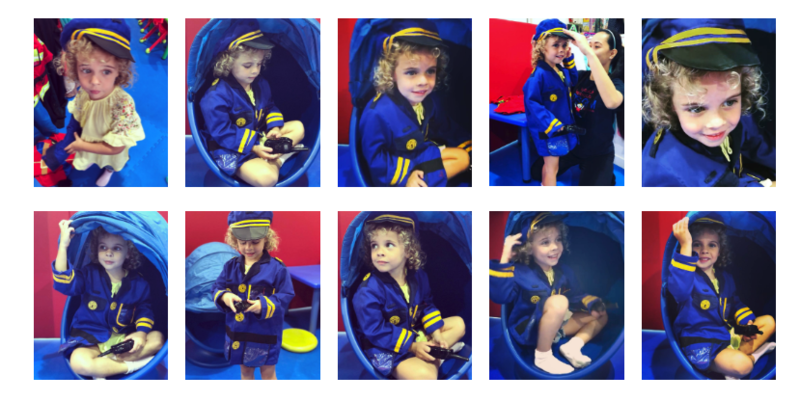 Each franchise location features ten pieces of uniquely designed therapeutic equipment that promote learning, development, and sensory-safe play. Learn more about the We Rock the Spectrum franchise, its specialized equipment, and the various services it offers by visiting its corporate website https://www.wrtsfranchise.com/.